… in the main, it reads like it was drafted by a public relations firm tasked with selling the current state of extraordinary, unaccountable powers and if anything, laying the groundwork for extending those even further. In response, the association has prepared its own series of Green Papers to help guide your online submission to the national security consultation before the December 1st deadline. These are (1) The New No-Fly Regime; (2) Terrorism Speech Offences; and (3) The New CSIS – a de facto secret police. Going to this link will provide a summary of the issues and recommended actions for each of the three topics. Clicking on the icon next to each topic will lead to a more detailed briefing. Note that these briefings are also reprinted in an easy-to-read format in Canada’s groundbreaking online news source, The Tyee.ca. OpenMedia is a Canadian non-partisan, non-profit advocacy organization working to encourage open and innovative communication systems within Canada and to ensure accountability in the Canadian government’s surveillance activities. 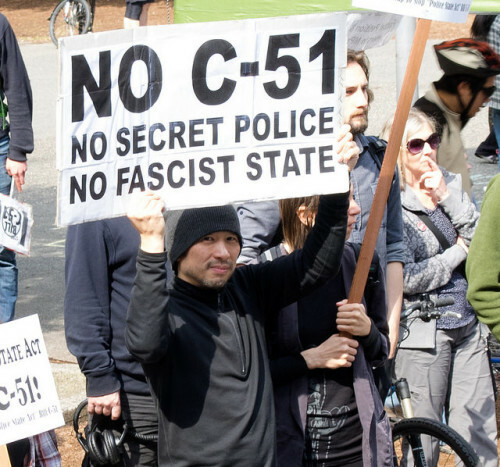 They have launched an online petition calling for the complete repeal of Bill C-51. Click here to go to that petition. This link also provides an array of further information including a detailed Privacy Plan and a consultation tool that provides guidance in responding to each of the 10 areas of the federal consultation, in accordance with the provisions of the Privacy Plan. Don’t forget to have your say before the December 1st deadline! And CLICK on our LATEST UPDATE to our September 22nd blog post, Colombia peace deal shows power of mediation, following the historic referendum which narrowly rejected the peace deal.